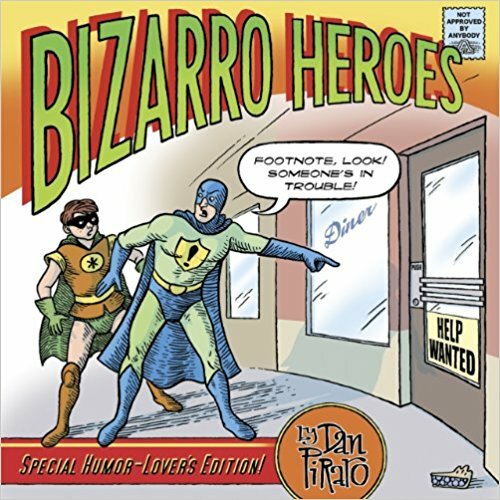 What others thought about "Bizarro Heroes"
Presenting a collection of super-hero-themed comics from the award-winning newspaper cartoon Bizarro. Cartoonist Dan Piraro skewers these masked and caped crime fighters like no other, poking fun at their super powers, superlatives, and their tights. Piraro's elaborate renderings often reveal the true identities of these heroes: Superman on the couch at home, the Hulk in his psychiatrist's office, Wolverine at the nail salon, and many more. Bizarro Heroes collects these smart, funny send-ups of all your favorite comic heroes in one incredible volume. Bizarro was first syndicated in 1985 and since then has built a steady and loyal following in the United States and Canada, as well as parts of Europe, Asia and South America. Bizarro has won an unprecedented three consecutive "Best Cartoon Panel of the Year" awards from the National Cartoonists Society. In 2010, Dan Piraro was given their highest award, the Reuben, for "Outstanding Cartoonist of the Year."